Care Packages for Soldiers: Half Price Books Donates DVDs for the Troops! Half Price Books Donates DVDs for the Troops! The Airborne Angel Cadets of Texas received a number of boxes of DVDs from Half Price Books. The DVDs will be included in the care packages we ship to our U.S. Soldiers, Sailors, Airmen, Marines and Guardsmen deployed overseas. The troops will be very happy to receive these DVDs as they will provide "cool" entertainment during the hot summer months. Thank you Half Price Books, we appreciate your support. 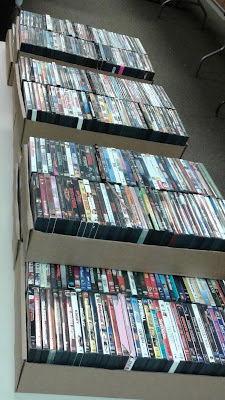 DVDs donated by Half Price Books. The Airborne Angel Cadets of Texas welcomes financial or product donations from companies, individuals and organizations who are looking for an opportunity to support the U.S. troops. There are many ways you can help; you can send requested items to us to be included in the care packages, donate funds through the Click and Pledge link at the top of the page or send checks made payable to: Airborne Angel Cadets of Texas, P.O. Box 116691, Carrollton, TX 75011.